What brings tourists to Stowe when the mountains aren't white and primed for skiers? According to my boyfriend's father, "People just want to go somewhere that's not horrible." But I think there's more to it. The same way that so many tourists journey to Montréal for its New France vibe, Stowe can be a pretty good approximation of the Alps. Even Maria from The Sound of Music thought so. Trapp Family Lodge may be ground zero for ladies to spin around on a mountaintop just as Julie Andrews did in the movie, but, last weekend, I checked out a more recent addition to Stowe's Alpine attractions. 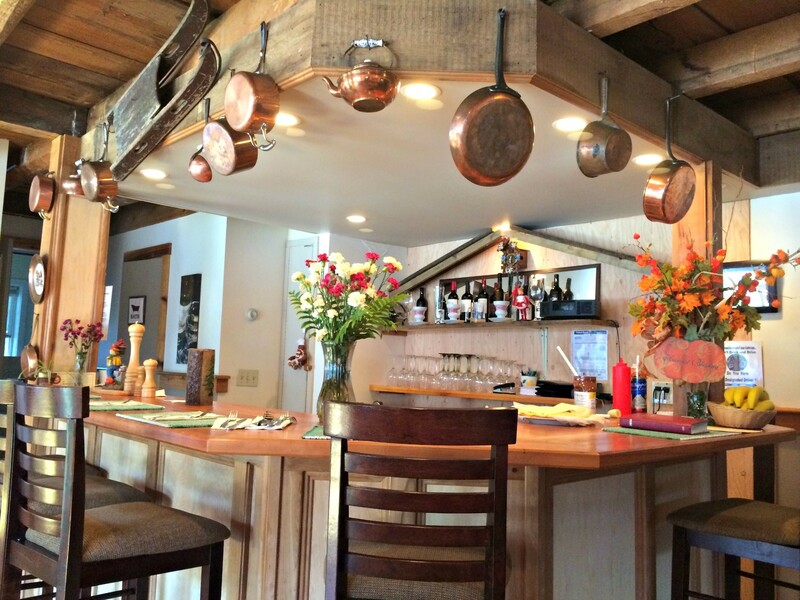 Chef Heinz Remmel opened his own restaurant on Main Street last year after several years of hopping from one pop-up location to another around Stowe, plying tourists with his crêpes and fondue. The dinner menu of cheese, meat or chocolate fondue is available at lunch, but high prices for top-flight filet mignon or Swiss Gruyère, vacherin and Emmentaler disqualified them from an Alice Eats selection. 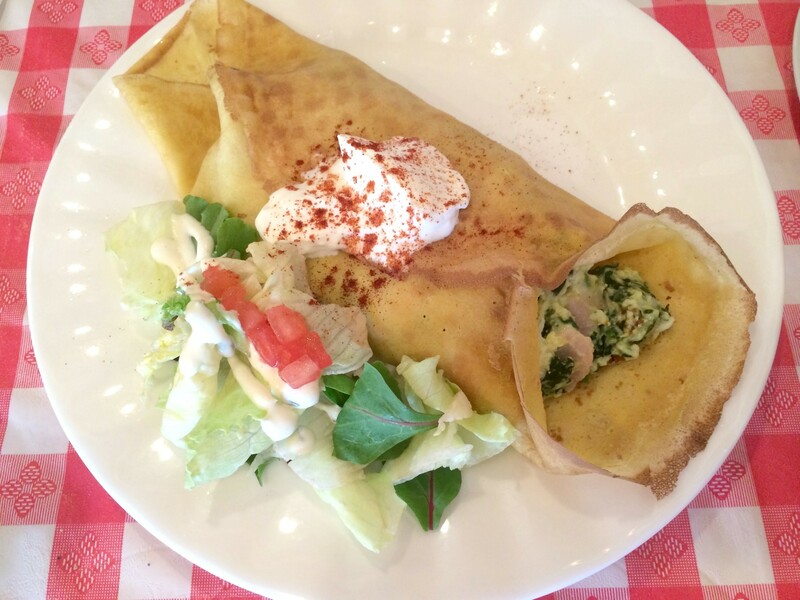 I stuck to lunch crêpes, but couldn't resist adding one of my favorite, hard-to-find treats — available on the dinner menu. Call it viande des Grisons, viande sechée, or, as German speaker Remmel does, call it bündnerfleisch. 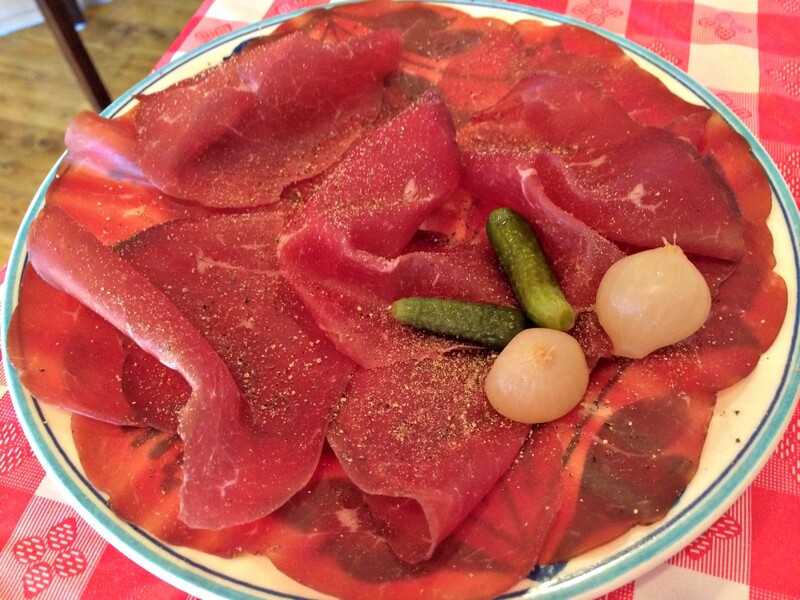 The air-dried beef, sort of like cow prosciutto, is one of my favorite delicacies. Though Remmel termed the meat "extremely expensive" as he served it, he offers an ample plate for $11. The paper-thin slices of meat are salty and betray a beefy flavor similar to dry-aged steak. Remmel added a liberal dose of ground pepper, which I found excessive in places, muting the more subtle virtues of the meat. Pickled onions and gherkins added a nice kick of acid and crunch, but I wouldn't have minded a few more. Remmel's crêpes are prepared in advance, then warmed and filled with ingredients he prepares in the open kitchen pictured above. Despite the fact that they're reheated, they were the most texturally ideal version of the thin pastry I've had in Vermont. 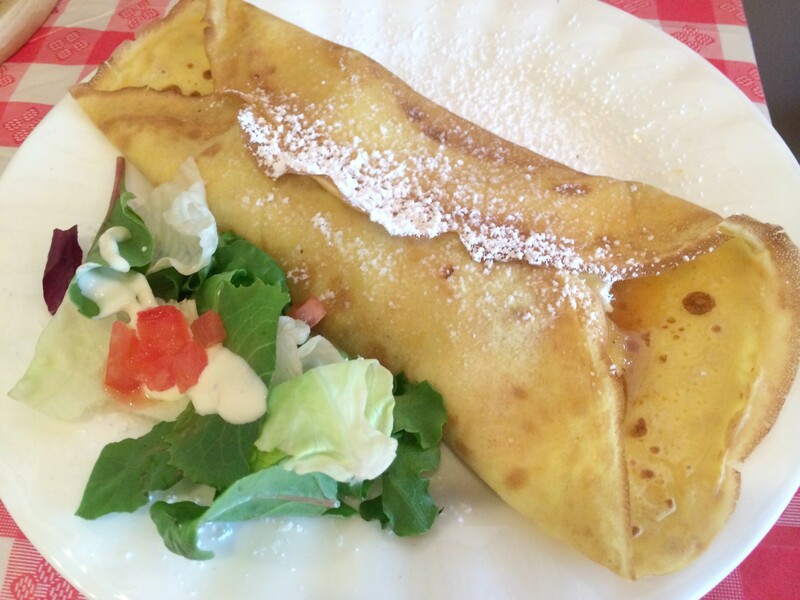 Forget the too-crisp, thin crêpes we're used to in the Green Mountains. Remmel's are indeed slim, with crunchy edges, but the bulk of its body is as airy as a popover. I would have been perfectly happy to have eaten a pile of them plain. But on a lazy Sunday, a crêpe St. Tropez hit the spot. It was filled with a moist omelette of finely chopped spinach, cubes of toothsome ham and a smattering of cheese. The salad on the side was very small, but made me feel like I was eating some roughage. I could have done without the mayo-like dressing, but the small quantity didn't ruin it. I toyed with ordering a banana-Nutella crêpe, topped with chocolate shavings and whipped cream, for lunch. But I'm a grown-up. I went for the apple-Brie one instead, with a touch of the savory added to the sweet. In fact, the dish as a whole was more sugary than I'd bargained for. I had anticipated fairly plain chunks of apple. Instead, the roll of dough held a cinnamon-speckled apple pie filling. A few chunks of brie simply weren't enough to mitigate the sugar high, especially with a dusting of powdered sugar on top. I guess I'lll just have to return for fondue soon. That way, I'll be guaranteed to get my cheese and my dessert in separate, bubbling pots.